The filter for measure column can be configured by opening the Measure Filter dialog from the Filter option in the Settings drop-down menu. By clicking the Edit… menu item, the measure filter dialog will open as follows. Configure the compare operator and the value to be compared against the selected column values. Click Apply to apply the filter settings to the widget. Now, the applied settings are saved, and these settings will be retained on reopening this dialog. Click Reset to reset the changes made in the dialog. This will also reset the filters applied before to that column. Reset will be in enabled state only when the filter is applied already. Apply will be in enabled state only when there are pending changes in the dialog to save. To clear the filter applied to the measure column, click Clear in the settings drop-down menu. This menu item will be in enabled state only when the filter is configured already to that column. 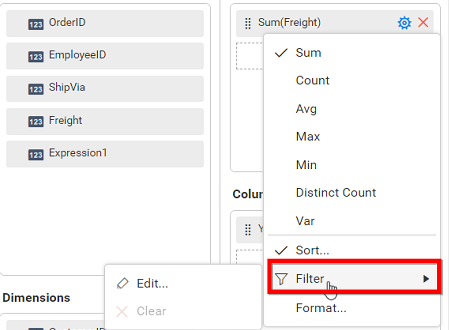 The filter for dimension column can be configured by opening the Filters dialog from the Filters… option in the Settings drop-down menu. The filters dialog will open as follows. This dialog consists of three different filters that can be applied individually or in combined manner. Through this filtering, you can filter the specific items from consideration. Click the list at top-right corner to drop-down the list holding the individual values of that column. You can check or uncheck each value or as a whole using the CheckAll. 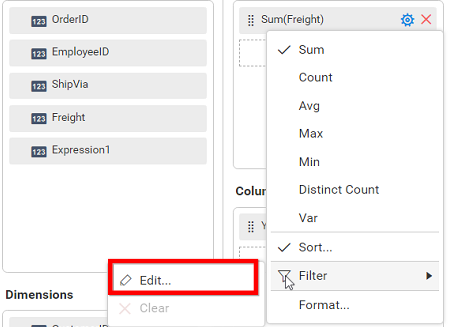 Include and Exclude options allow you to choose whether to consider checked items for inclusion or exclusion in filter respectively. The Search text box helps you to filter the items from the large list and search for specific one. Click Apply to save the changes made in the filter drop-down list. 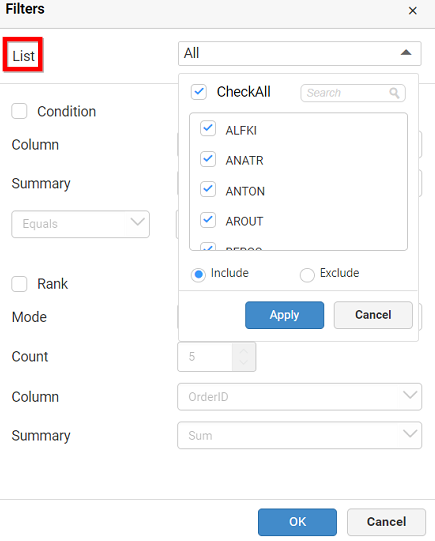 Click Cancel to cancel the changes made in the filter drop-down list, if required. Click OK in the filters dialog to save the changes made with respect to item-based filtering. Click Cancel to ignore the changes made in the filters dialog, if required. Through this filtering, you can impose a condition based on which the filter need to be applied. This filtering option is disabled, by default. You can enable it by clicking the Condition check box. 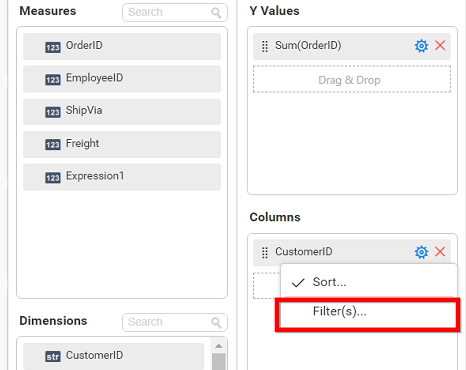 Set the column near the Column label, by which the filter criteria need to be defined. Set the summary type near Summary label, based on which aggregation need to be applied over the selected column. Set the compare operator and the value to compare against the column values. Click OK in the filters dialog to save the changes made with respect to condition-based filtering. Click Cancel in the Filters dialog to ignore the changes, if required. 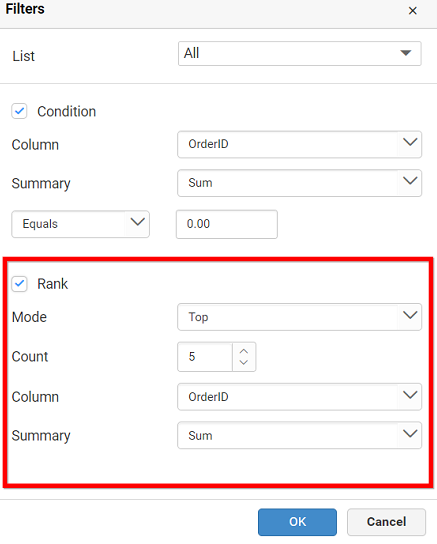 You can filter the n items by setting the mode, count, column, and summary fields through the rank-based filtering. You can enable it by clicking the Rank check box. Set the top or bottom mode in the Mode field, and set the number of records to filter in the Count field. Set the column name in the Column field based on which the filter need to be applied. 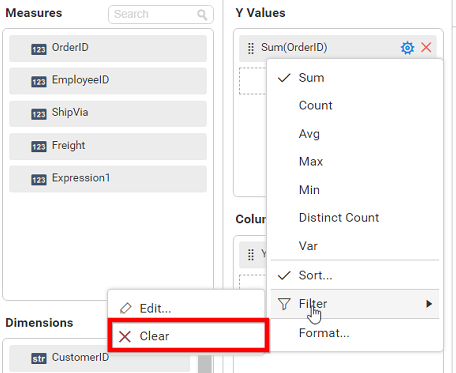 Set the summary type in the Summary field based on which aggregation need to be handled whose output should have been compared with corresponding value in widget bound data. 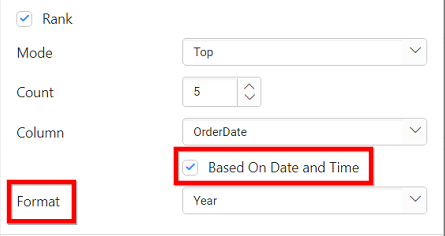 For date Column field, you have additional option to format the Column field by enabling Based On Date and Time. 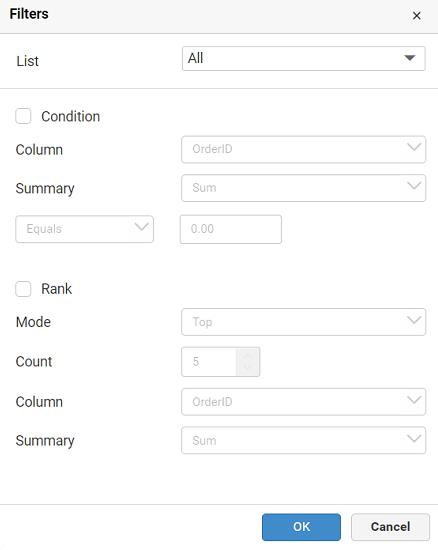 Set the format type in the Format field need to be handled whose output should have been compared with corresponding value in widget bound data. Click OK in the filters dialog to save the changes made with respect to rank-based filtering. When all these three filters are configured and applied, the records that satisfy the criteria of three filters will be considered by the widget. 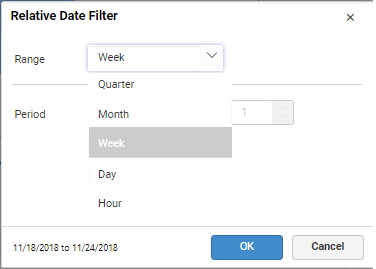 Click the Relative Date Filter… option in the Settings drop-down menu corresponding to that date-time column to open the Relative Date Filter dialog. This dialog allows you to configure the filter for the date-time column. For example, if you configure last week as the filter, you will get the last week data in the widget. After a week, if you check, it will show you the last week from the start day to the end day. From this, you will no longer need to set the filter statically and change week by week to see the last week results. In this dialog, set the range as year, month, or week, etc., like in the following Range label. Set the period in the Period label to see data in the defined range. 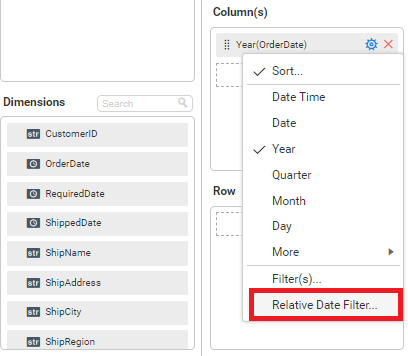 You can pin the relative date filter to specific date to specify the data relative to it. 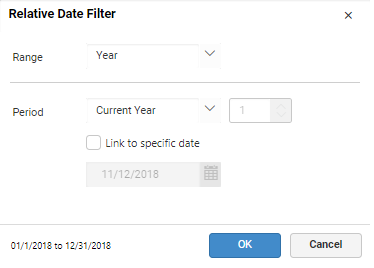 For example, if users set last month in relative date filter and link the specific date to 22/Nov/2000, it will bring last month data relative to the specific date. You can see the preview date (highlighted below) in the dialog based on the values you set. Click OK to save the changes and apply the filter. Click Cancel if required, to ignore the changes made.